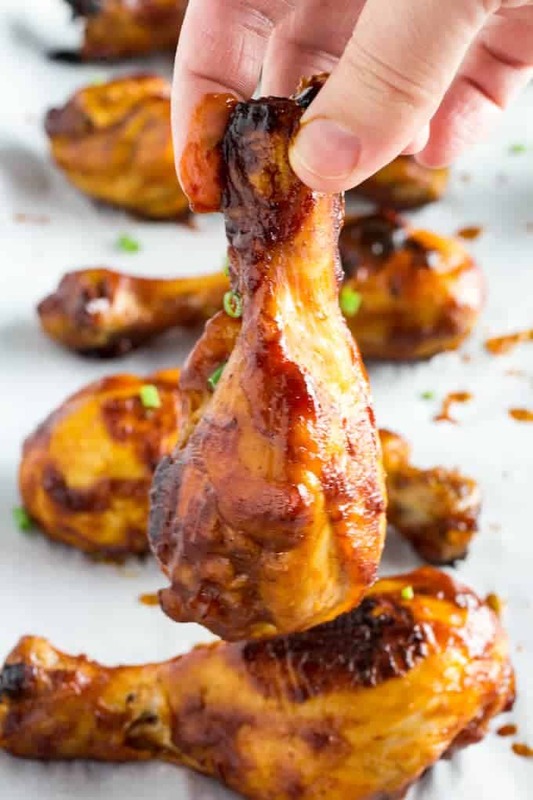 Baked BBQ Chicken Drumsticks are super easy to make, and entirely gluten free. They bake in the oven with your favorite bbq sauce for a dinner that only takes 2 ingredients and is ready in only 45 minutes! …said nobody ever. Another thing that’s never said is how much everyone wants to rush home from work and make a 3 course dinner for the family after working an 8-12 hour day. 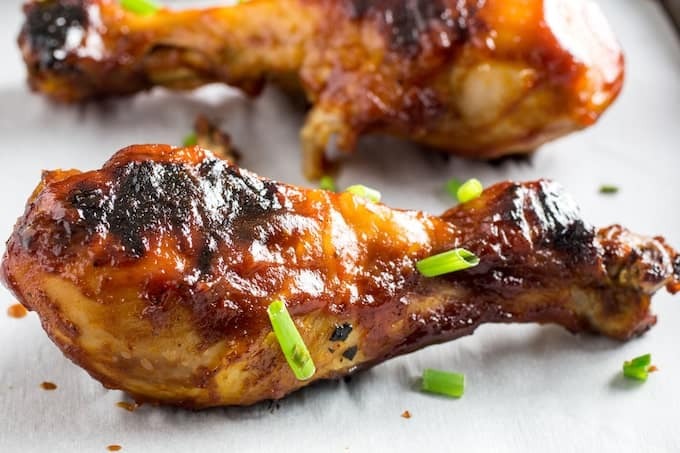 That’s why it’s important to have a handful of recipes, like this Baked BBQ Chicken Drumsticks Recipe, up your sleeve that can be done quickly, efficiently, and leave time for the all-important post-work nap session. At least, that’s how I feel about it. If it were up to me, there would be 3 golden ways to make chicken drumsticks: Oven, grill, and slow cooker. But to be completely honest, when I’m looking for a fast and easy recipe, I don’t want to fire up the grill. And I don’t always get home in time to have the slow cooker going all day. Which is why the oven comes in handy. You don’t need propane or charcoal to light the oven. The grill might be a mighty, mighty tasty cooking vessel. But it’s also high maintenance. You don’t need to clean the oven afterwards. I’ll admit, I turn the heat up and burn off whatever’s leftover on the grill. It makes the scrubbing so much faster. But still, not something I want to do on a Monday. I don’t worry about anything burning. Now, I’ll admit, I’m not the most savvy grill master out there. So I have a healthy fear of my food burning to a crisp whenever I light it up. Which is why the oven, with its nice pre-set temperature and trustworthy baking sheet, causes me 10x less anxiety than the grill. It really doesn’t take long to cook in the oven. 40-45 minutes, tops, so don’t go too far. A lot of times I’ll put my bbq drumsticks in the oven and immediately start preparing my side dishes. By the time they’re done, so is the rest of dinner. Or, you know, cocktails. Whatever. Flip them over! You only want them to cook for about 20 minutes on each side, that’s how you get the real BBQ look. It’s the side on the bottom that starts to crisp up first, so if you want it even, set a timer and flip it over. Save some sauce for later. If you’re wondering how to bake chicken drumsticks so they turn out super amazing, the sauce reserve is key. The sauce will dry up in the oven, so you want to save a bit of the BBQ sauce. I put extra sauce on as soon as they come out of the oven. The already hot bbq chicken drumsticks will warm up the sauce, too. Ok, let’s get to the good part already. The BBQ sauce part of bbq drumsticks. It’s what we’ve all really been waiting for, isn’t it? I’ll be straight with you. I love making gluten free BBQ sauce (<- click there for my recipe) from scratch. There’s so many ways to do it! And you can get a bigger batch than a store bought jar for 1/4 the cost. Also, you can have 100% certainty that this is really gluten free. Plus it only takes about 20 minutes to make. But, if you have too much going on and really can’t commit to homemade bbq sauce for your baked bbq chicken drumsticks, I won’t blame you. You can use whatever your favorite brand is. 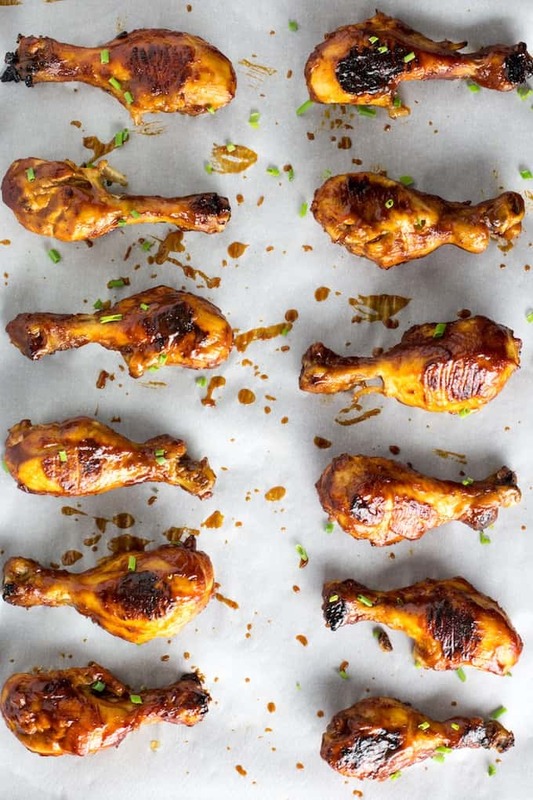 Make your bbq drumsticks your own. 5 More Chicken Drumstick Recipes, and Bonus Wings! 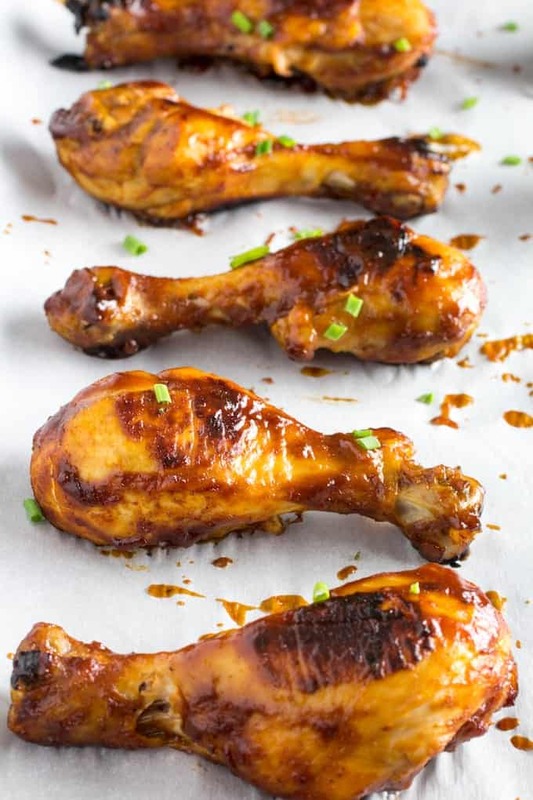 Sweet & Sticky Oven Baked Chicken Drumsticks – Here’s an Asian twist on chicken drumstick recipes using a lot of sweet and savory flavors. 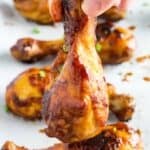 Garlic & Herb Baked Chicken Drumsticks – One of my most popular chicken drumstick recipes, using herbs you probably already have in your cabinet! Slow Cooker Buffalo Chicken Wings – I love this one for parties! It’s super simple and everyone already loves the buffalo sauce. Bacon Wrapped Chicken Wings & Tequila Chipotle Dipping Sauce – This one takes a little bit of time, and a whole lotta’ love. But the end is the most amazing wings you have ever tasted! Crispy Oven Baked Garlic Parmesan Wings – This is my personal, all-time favorite wings recipe. It’s not spicy, so the entire party will love them not just the spice lovers! I bring a tray of these and they’re gone before half time. Preheat oven to 375F. Line a large baking sheet with parchment paper. Lay drumsticks on baking sheet, spacing evenly. Using half of the BBQ sauce, brush both sides of drumsticks with sauce. Place in oven and cook 20 minutes. Flip and cook an additional 20 minutes on other side, or until chicken reaches internal temperature of 165F. Once done, remove from oven and brush with the rest of the sauce (or reserve for dipping). 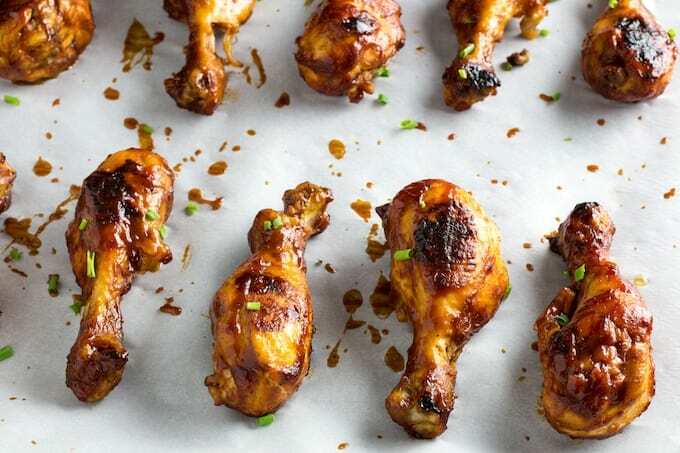 Your drumsticks should get a "grilled" look from baking at this temperature. But if it doesn't, you can stick them under the broiler for 1-2 minutes each side. Watch carefully, the broiler can burn them really easily if you don't watch them!